The endless white sandy beaches, the turquoise blue lagoons and the clean nice warm seawater all these are things for which Mauritius is so famous. There is an offshore riff almost around the whole island. It is the main factor in the genesis of this paradise with beaches and lagoons. The coastline of Mauritius is approximately 330 km long and nearly everywhere you can find the nice sandy beaches. Many of these beaches are situated next to the big hotels. 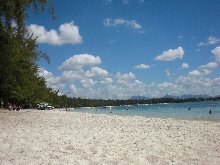 However it is important to know that all beaches of Mauritius are public. Furthermore the coastal regions of the small island in the Indian Ocean offer the best environment for any kind of water sports. Further information about the different water sport activities can be found here. Blue Bay – the bay with its nice deep blue color in the southeast of Mauritius. Once you reach the bay of Blue Bay, you know where the name comes from. The colors of the sea are incredibly powerful and consist of a variety of many different blues. The Blue Bay has a very nice public beach which is perfectly suited for swimming and relaxing. Blue Bay, as well as the general area in the south and south-east is not so much touristically tapped. That is why the beach of Blue Bay is very quiet during the week. On weekends, however, one has the feeling that the half population of Mauritus pilgrimages here to spend some nice free days at seaside. If you walk the bay down a little to the left you will first pass by a hotel. Continue the way and a series of small lonely beautiful bays opens up. They are also very quiet at the weekends. Blue Bay is particularly famous for its snorkeling trips. Since 1997, a 353-hectare area which is located in the sea just in front of the public beach is appointed as the first and until now the only Marine Park in Mauritius. The reasons for the foundation are the unusual and unique coral gardens, which are situated here. The marine ecosystem provides a rare beauty with its many different species of flora and fauna. These are especially the corals, which are in an incredibly good condition. 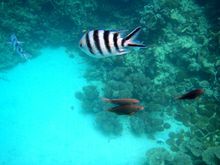 Overall a figure of about 72 different corals and 32 different species of fishes are founded in this area. The corals are sometimes even up to 800 years old. 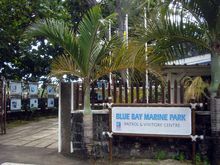 Opposite the Public Beach is located a visitor center of the Marine park where you can get information about the park. To reach the park the best way is to go out with a glass bottom boat. The trip will take between 1 ½ and several hours. First the boat will drive you through the park, which is already an experience. Through the glass bottom of the boat you will have a good visibility up to the ground of the park and the skipper will provide you most probably some information about the different corals and fish. Afterwords the boat will anchor and you have the opportunity to go snorkeling. The underwater world in which you dip here is really unique. The centuries-old coral garden and the various fishes that pass by make you feeling as if you were a part of them. Depending on what you arranged with your skipper, you can now visit the Ile de Deux Cocos which provide some beautiful beaches. The skipper will pick you up after some time to bring you back to the public beach of Blue Bay. I can highly recommend you to do the trip with the nice skipper Clive. He knows a lot about the underwater world and has been working as a skipper in Blue Bay for eight years. 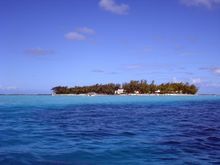 In addition, Clive also provides different trips to the offshore islands of the south of Mauritius. 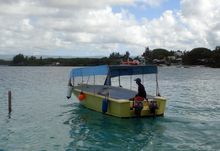 Otherwise many skippers on the beach of Blue Bay will offer you the trip with the glass bottom boat. Or you have the opportunity to go to the visitor center and ask for a skipper. The rates vary between Rs 300 up to Rs 500 depending on length and season. Try in any case to negotiate a good price. 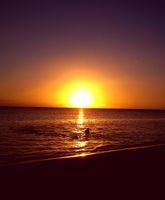 Some of the most beautiful beaches on the island are situated along the east coast. One of these is the beach of Belle Mare which is a miles long white sandy beach stretched till the next small village Trou dÈau Douce. Because of its length the beach of Belle Mare is perfectly suited for sport activities like jogging and walking and also it is great for endless long walks along the coast. 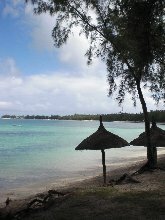 If you walk the public beach down to your right hand you will pass next to one of the best hotels of Mauritius. 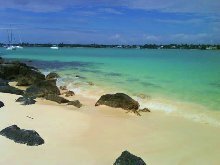 Another peculiarity of the beach of Belle Mare is the combination of the colors. The turquoise deep blue lagoon ends up in a white clean beach which is bordered to lush green grassland covered by many trees and plants which provides also many shadow possibilities. But: You should be careful if you want to go swimming. The sea has a quite strong north current. Please stay close to the beach and don’t swim too far out. The beach of Flic en Flac, located on the west coast of Mauritius is the longest beach of the island. It covers a long part of the west coast and provides also perfect possibilities for endless beach walks. If you walk the beach down to the south you will reach the next village Tamarin after approximately 1 ½ hour where you will find the next gorgeous beach as well as the best spot for surfing in Mauritius. The beach of Flic en Flac is a natural beach which is the cause for the ashore corals, sea urchin and shells which makes the beach special and unique. Of course the beach of Flic en Flac provides also a turquoise blue lagoon which offers best swimming possibilities with out strong currents. One thing you need to take care of is the sea urchins which appear in the water. A good protection is to wear swimming shoes which can be for example bought in the supermarket. On weekdays the beach of Flic en Flac is quite empty and calm in opposite to the week-ends when the beach is well visited by natives coming on the beach for camping and enjoying the days off. On the northern end of the beach you can find a beach volleyball net which belongs to the Hotel “Villa Caroline”. In spite of it everybody can play on the net. Almost everyday after 5 pm you will meet some volleyball players for a match. The bay of Tamarin is one sight you definitely should visit during you stay in Mauritius. This small village has a special atmosphere and charm and is one of my favorite places in Mauritius. Some of its particularities are first of all the Black River which comes from the highlands and ends up in the bay of Tamarin whereby a gorgeous view over the river land and the adjoin mountains of the high land of Mauritius is given. The river cuts the beach of Tamarin in two parts. You can reach from one part to the other by crossing the river by foot. When it rains a lot and the high tide comes the water in the river can be quite deep but most of the time it is not a problem to cross it. Another particularity is the ground of the sea which consists only of sand and some stones. You don’t need to worry about sea urchins and corals which means there is no need for you to wear swimming shoes. Furthermore Tamarin bay is one of the rare places which hasn’t got an offshore riff therefore the sea in Tamarin is tougher and if there are the appropriate weather conditions you can see meter high waves dashing into the bay. In the shallow water of Tamarin Bay it is not dangerous to swim, surf and enjoy the waves. Only sometimes the sea can have a very strong current which can pull you out into the deep sea. But if there is a current you won’t see anybody in the water. It is always good to ask locals before going swimming anywhere where you don’t know the water. Between the missing offshore riff in Tamarin is one of the best surfing spots in Mauritius especially for beginners. 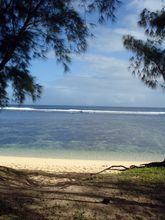 Get further information about surfing in Mauritius here. On week days the bay of Tamarin is very lonely and calm. It can happen that you have the entire beach for yourself but on week-ends especially Sundays all locals of the surroundings meet up at the beach and enjoy the sun and the sea. Friday and Saturday night there are often people who set up a campfire singing, dancing, drinking and having a party on the beach. About 5 km south of Tamarin the next village La Preneuse with its nice small bay is settled. A small public sandy beach belongs to this village. This place is very interesting for going snorkelling. The once destroyed offshore coral riff starts growing again and provides very nice underwater views. The Mauritius Marine Conservation Society (MMCS) which is located (in) here is planning to open the second marine national park in front of the bay of La Prenouse. The sea is safe for swimming however it is better to go swimming a bit to the south of the main entrance of the public beach because of some little current which can be on the other side. But you will find a sign on the spot. The beach of La Preneuse is also very nice for watching the sun setting in the Indian Ocean if you prefer to do that on a lonely place. In front of the public beach there are located a watchtower and some old cannons from the time when the pirates entered Mauritius which gives you a little impression of the history of Mauritius. Le Morne is a small village in the southwest of Mauritius. The town was founded by former slaves. The beaches of Le Morne are located on the peninsula on the foot of the Le Morne Brabant, an approximately 550 meter high mountain. The Le Morne Brabant was adopted by the UNESCO as World Heritage since 2008. The reason is, above all, his tragic history. In the 18th and early 19th century, hundreds of slaves fled to the mountain and have been hiding there for fear of their holders, who actually wanted to deliver them the decision of the discharge and the freedom of the slaves. The high fear of the slaves drove them to their deaths, since many of them jumped down from the high mountains before the men could absolve them. Since this sad event the Le Morne Brabant is a symbol of the slaves fight for freedom. From the main road a junction is leading up to the peninsula. If you follow this road you will reach the public beach of Le Morne. The white coral sand beach is very beautiful and a destination for a weekend trip of many locals. A particularity of the beach of Le Morne is the very clear water which provides a beautiful visibility. If you go swimming please beware the current that sometimes is strong. But bathing is in general safe here. Furthermore the trees which are bordering the beach are providing good shade opportunities. Take the road a little further, you come to the next beach of Le Morne, which is particularly popular for windsurfing and kite surfers. Perfect wind conditions are given almost all year-round. Also for all non-surfers among us it is worth to make a trip to the beach to watch the professional surfers. Swimming at this beach is also possible. However, you should orientate a little bit left of the surfers, because otherwise unpleasant collisions may occur. Those who prefer to enjoy a calm and sheltered beach should choose the first of the two beaches of Le Morne. 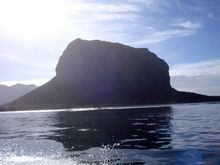 In the southern part of Mauritius between Bel Ombre and St. Fénix is located a small island Ilôt Sancho. The island is reachable by walk from the beach of the Riviere des Gallet by crossing the very shallow sea on this spot. The island itself is very small. You can make a walk around the island in approximately 10 minutes. On the island there is not much to see except a small forest. But anyway it is a nice place for a short visit. In front of the beach of Riviere des Gallet there is another surfing spot which is not suitable for beginners because of the strong current and the shallow water over the coral riff. A surf competition is organised on this spot once a year in November/December where you can watch the best local surfers. The sea on this spot is not really suited for swimming. But on the right part of the island you also can go swimming and enjoy the sea. In the past the Ilôt Sancho was a prized place for pirates where they buried their loot. 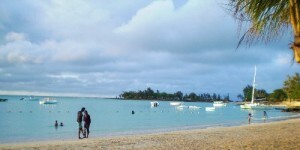 The public beach of St Félix is another beautiful beach of Mauritius. St. Felix is located also in the south between the towns of Belle Ombre and Soulliac. Actually St Félix has even two public beaches; however, the second beach from the direction of Le Morne is much more beautiful. To get there you have to continue the road after the direction sign to the public beach of St Félix a little bit until you reach a roundabout where you have to take the third exit. From here you can even see the sea. 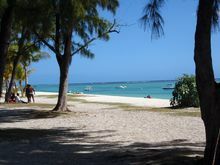 The beach is wonderful, the exceptionally white sand, which flows into the turquoise green of the Indian Ocean of Mauritius, gives a wonderful contrast to the verdant trees of the back land. The beach of St Félix is very lonely and offers an excellent opportunity to chill out and relax. However, a small disadvantage from the beach of St Felix in Mauritius is that bathing is problematic. First the ground of the lagoon is covered with corals in which one or the other fish from the family of the highly toxic stone fishes can be founded. Secondly the current can be quite strong and should not be sneezed. A different beach in the south of the Riviere des Galets. For ages the river has rolled the stones down to the shore. The sea ebb and flow have scluptered them smooth. Neither the river nor the sea would like them to be removed from there. It is a great place for a picnic or just to enjoy the natural forces.Here you can smell the sea and the mountains, hear the water and the movement of the stones and see the waves.So it’s an experience for all senses. The beach is located between Souillac and Bel Ombre.If you follow the coastal road from east to west, it is soon after the Public Beach of St. Felix. This is not a beach for taking a bath, but a very impressive place in the south of the island. Generally, in the south, the bathing is more dangerous than on other beaches, because here the island is not protected by the reef. The currents in the water are dangerous and there are sharks are frequently seen. 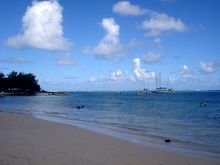 The public beach of Mont Choisy is situated between Pointe aux Cannoniers and Mont Choisy not far away from Grand Baie. The beach belongs to one of the longest and most beautiful ones in Mauritius – you can take a walk for more than 3 kilometers. Many sports activities such as jogging, aerobic and waterskiing can be done there aswell. During the week there are only a few tourists who share the huge sandy beach. There is more than enough space for you to enjoy the sun. 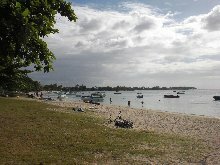 If you wish to have a little bit more comfort you can rent sunloungers and sun umbrellas at the southern end of the beach near Mont Choisy. From there it is only few minutes walk to reach the Hindu statues which are put close to the ocean. Even though it is very quiet from Monday to Friday the beach will be crowded with locals especially on Sundays. Many people come here to spend the weekend at the beach and have a good time with the whole family. Food, as well as tables, chairs, music and any other thing that might be needed at the beach is brought along. Even though not really relaxing is it a very interesting and funny experience to spend a day at the beach at the weekends. If you feel hungry you can just go to one of the many stands in the shadow of the filao trees and have a little snack. Some minutes drive from Grand Baie in the middle of Pereybere you can find a nice and busy public beach, which is visited by locals as well as tourists. Lying on the white sand int the bay you can watch the turquoise sea and the catamarans which pass by from time to time. There are many bars and restaurants around which offer food for any taste. There is Chinese as well as European and Mauritian cuisine. You should also try the doner kebab which is sold in little sales carts. It is really tasty, but be careful – the spicy sauce is really spicy! The public beach of La Cuvette is only some metres away from the centre of Grand Baie. If you drive from Grand Baie to Pereybere you will see a little sign on the left sight which shows the way to the beach. Right next to it there is the restaurant and nightclub Godfather. Here you can relax on sun loungers which can be rented and you can get fresh pineapple, coconuts and some other snacks. 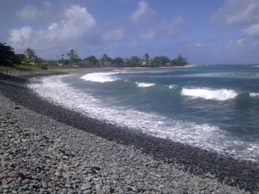 To the left side you can easily walk along the beach around ten minutes to get to the centre of Grand Baie. When you reach it you can see the little, but famous fish market. In case you are not worried about the hygiene you can buy fish which has been caught some minutes before. This beach is great for sunbathing as well as snorkeling and any other kinds of sports activities. As Trou aux Biches is a fisher village there are many boats in the water, but there still enough room left to swim a bit. Some people even call it one of the best beaches in Mauritius as the water is very clear and the reef is close so snorkeling is easy accessible. 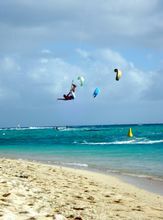 You can also do water skiing, parasailing, kayaking, boat racing, big game fishing and diving. Even from the distance you will see the guys wearing red T-Shirts which will be more than happy to help you. In case you have further questions or would like to book in advance just call Kayne +230 261 4748. The beach is easy accessible as a bus station is right in front of it. 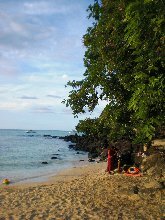 Buses to Port Louis leave at least every 20 minutes and on the way you can stop at the beach of Pointe aux Piments. This beach is very natural and bathing is not allowed as the streaming is quite strong and the beach is covered with rocks.